Teacher Vivian Gauvin from Moose Jaw recently sent us this report of her high school’s experience with POH; we think you’ll like her idea of where the photo of the tiles should go at the end of the year — who knows, it might just catch on with other schools! Moose Jaw Saskatchewan’s Central Collegiate students from grades 9-12 took part in commemorating Crow Stand IRS in Saskatchewan. Since many of the students had the opportunity to view the 100 Years of Loss Exhibit that the Prairie South School Division hosted with the Moose Jaw Art Gallery, they were able to delve deeper in the Project of Heart research.The 227 tiles that were painted allowed the students an opportunity to reflect on the weightiness of the subject as well as developing inter-generational dialogue. 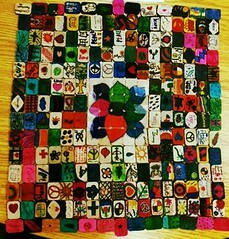 A photo of the Project of Heart tiles was taken for the Central Collegiate yearbook to continue the learning about the legacy of the Indian Residential Schools.